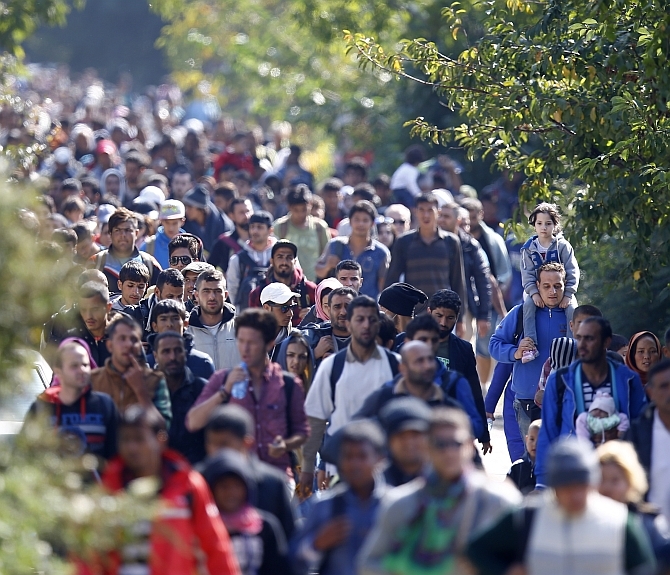 Rediff.com » News » Will Europe fall apart over migrant crisis? 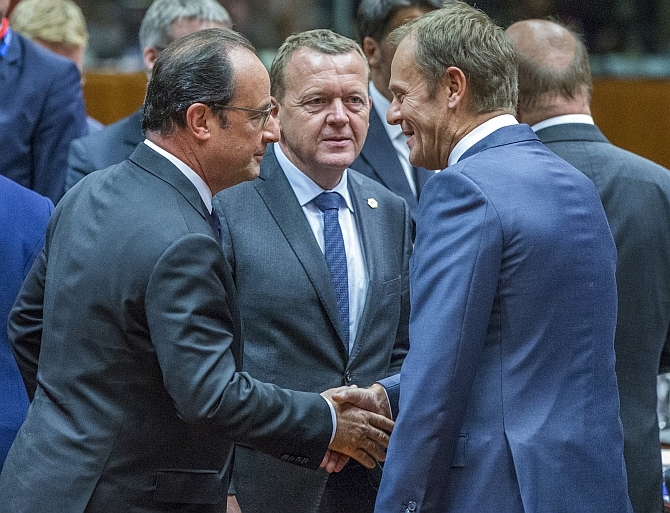 Will Europe fall apart over migrant crisis? Hundreds of migrants, who continue to arrive in Europe as they flee the scenes of chaos and brutality of the Islamic State in the Middle East, have created sharp divisions among European Union member states which are increasingly finding it tough to control the massive influx. EU officials are struggling to come up with a coherent response to the crisis, the largest migration the continent has seen since the end of World War II. Hungary's foreign minister Peter Szijjarto on Wednesday termed the European Union migrant quota plan to relocate thousands of migrants across the continent as "unfeasible, unrealisable and nonsense". As EU leaders meet in Brussels on Wednesday to approve a plan to relocate 120,000 attacked by eastern European countries, Szijjarto called the quota scheme a waste of time. Romania, Czech Republic, Slovakia and Hungary voted against the plan to take in refugees and migrants from Italy and Greece but it was forced through. British Prime Minister David Cameron has called on Europe to "do more to return migrants" to their countries of origin. Speaking with French President Francois Hollande, Cameron said more action was needed to help those with a genuine claim to asylum from war-torn countries. More than 488,400 migrants have come to Europe by sea so far this year, double the number that arrived during all of 2014, according to the International Organization for Migration. At least 8,750 new migrants entered Croatia in a single day this week, according to a statement released Wednesday by the country's Interior Ministry. 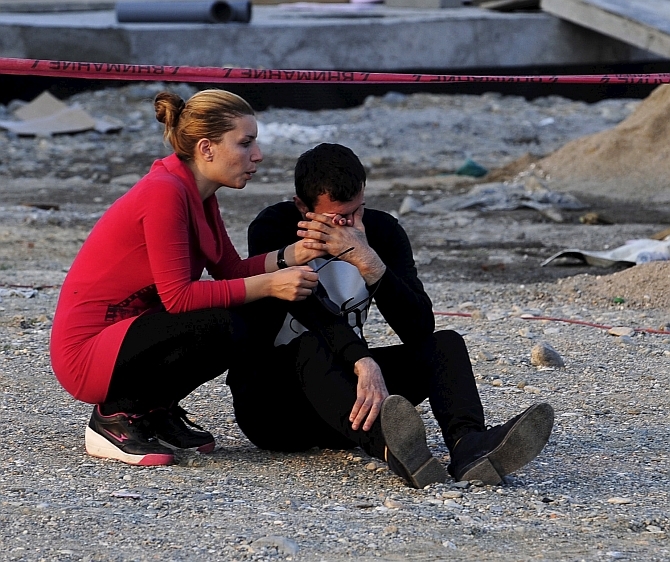 That number, reported to have entered the Balkan country Tuesday, brings the total number of migrants having entered Croatia to 44,000, the ministry said, without specifying the time period involved. Germany, which has promised to take in the maximum number of migrants -- some 40,206 -- too realises the urgent need to control the migrant influx. German Interior Minister Thomas de Maiziere said there is a limit to the number of migrants European Union member states can take -- claiming they "can't take every refugee". In the latest admission of the country's excessively generous policy towards the migrant crisis, he said: "We cannot accept all the people who are fleeing conflict zones or poverty and want to come to Europe or Germany." The interior minister proposed that the EU creates legal routes of passage into Europe that would precisely count the arrivals of migrants and introduce strict quotas. Shortly after the EU Member States adopted the decision to relocate 120,000 refugees on Wednesday, European Commission President Jean-Claude Juncker said: "In spite of our fragility, our self-perceived weaknesses, today it is Europe that is sought as a place of refuge and exile. This is something to be proud of, though it is not without its challenges." "The first priority today is and must be addressing the refugee crisis. The decision to relocate 160,000 people from the most affected Member States is a historic first and a genuine, laudable expression of European solidarity. It cannot be the end of the story, however. It is time for further, bold, determined and concerted action by the European Union, by its institutions and by all its Member States," he added. French President Francois Hollande was more blunt. "Those who don’t share our values, those who don’t even want to respect those principles, need to start asking themselves questions about their place in the European Union," he was quoted as saying by the Associated Press on his way into the meeting. His remarks came after four eastern European nations -- the Czech Republic, Slovakia, Hungary and Romania -- voted against a plan adopted on Tuesday to relocate 120,000 asylum-seekers to other member states over the next two years to ease the strain on Italy and Greece, which are on the front line of the crisis. In fact, the Slovakian government announced on Wednesday that it was suing the European Union over the quota plan. The Hungarian parliament has already passed a law giving the army new powers to tackle the migrant crisis. The decision to override the dissenters means the EU will be sending thousands of people to nations that do not want them, raising questions about both the future of bloc and the well-being of the asylum seekers consigned to those countries. 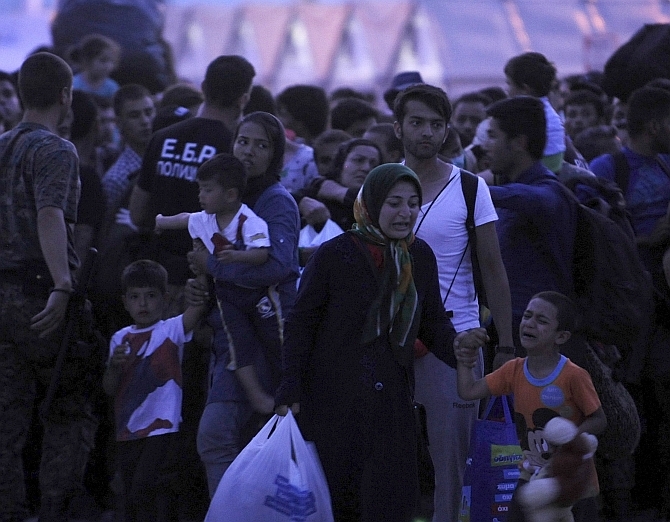 What's the EU migrant crisis about? 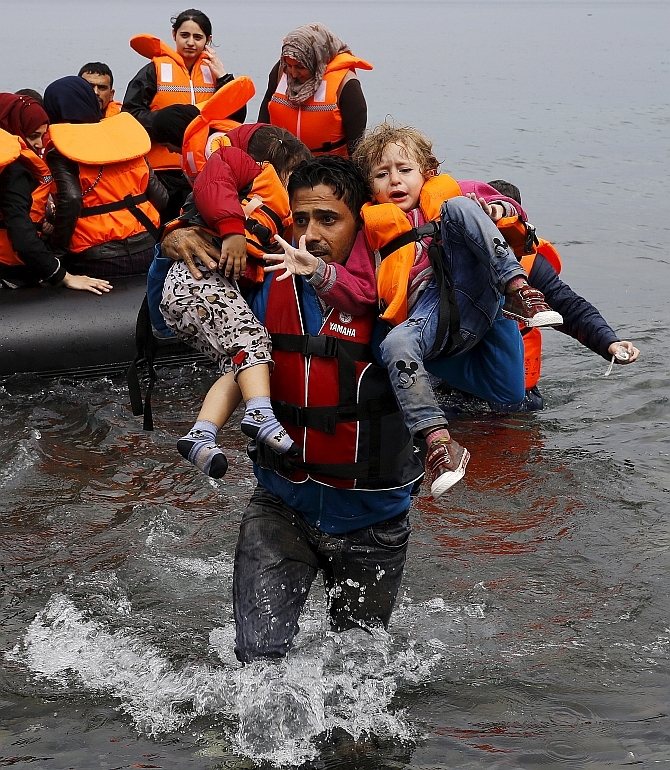 Migrant crisis: Can Europe take it anymore?